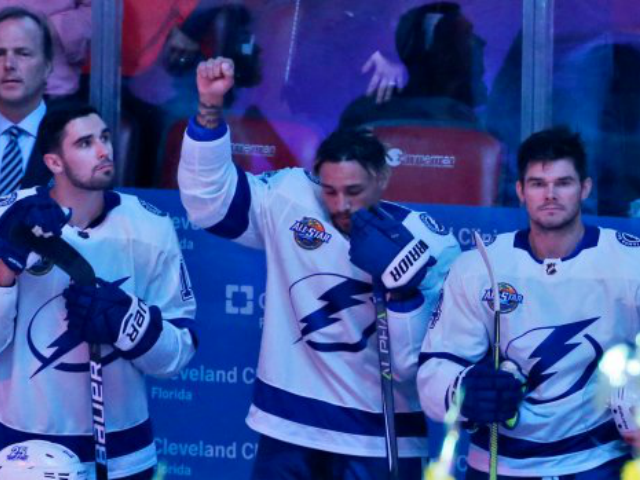 National anthem protests have now come to the National Hockey League, Tampa Bay Lightning forward J.T. Brown raised a fist while the anthem played on Saturday night. “Some will tell you that’s disrespecting the military, well I wanted to hear it from someone who is serving, not some person on Twitter,” Brown told the Tampa Bay Times on Thursday. “Some thought (kneeling) it was disrespecting, but most felt that we have a right to do it, regardless of whether they agree with you or not, or would stand next to you,” he added. The player said he consulted with his coach and teammates before he mounted his protest. Brown also said he had no idea how long he would continue the protests. The NHL might be forewarned about allowing such protests to grow. A recent report revealed that the National Football League lost its status as the most popular sport in the land. The poll taken during September found that the NFL’s favorable opinion among its core base of fans has dropped 31 percent since August.